If You Like Reacher, You'll Love The Preacher. Once he served God as a priest. Once he served his country as a soldier. Now he serves fate...and his need for redemption...by roaming the country as a professional gambler known only as The Preacher. He brings his high-stakes game of death and justice to a California casino that's the temple for a deadly cult led by a brilliant psychopath with horrific intentions. This is the third and final book in Ted Thackrey Jr.'s epic, Edgar Award-nominated trilogy. 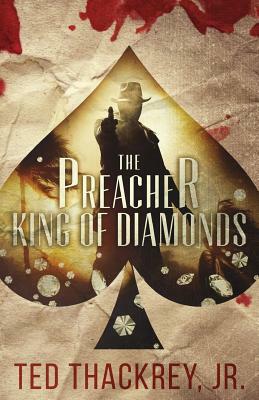 PRAISE FOR "KING OF DIAMONDS"
"If this newest thriller featuring the enigmatic poker player and spiritual adept known as Preacher were a hand of five-card draw, it would be a royal flush, aces high. Thackrey ( Aces and Eights ) deals all the right cards in a fast-paced, streetwise story right out of the sordid headlines of the past two decades. He raises the ante by throwing in several mysterious characters whose loyalties cannot quite be trusted, along with a fiendishly clever psychopath who founds a satanic cult with a California casino as its temple. A generous helping of suspense, romance and adventure is interestingly spiked with Preacher's excursions into Eastern mysticism. And when Thackrey finally calls the cards, the result is a rip-snorting, cinematic finale that races like a speeding train. The book's last pages offer a graceful, low-key coda in which Thackrey subtly restores the moral order and suggests that personal integrity means something, even in a world gone mad with greed and brutality." Publishers Weekly.